WASHINGTON — President Barack Obama is bringing words of comfort and sympathy to grieving families of victims of the shooting rampage in Roseburg, Oregon, muting his message about the need for new laws to stem gun violence as he visits an area where firearms are popular. Obama will talk with family members Friday at the start of a four-day West Coast trip. Eight community college students and a teacher were killed before the gunman fatally shot himself in front of his victims after he was wounded by police. Staunchly conservative Douglas County is bristling with gun owners who use their firearms for hunting, target shooting and self-protection. A commonly held opinion in the area is that the solution to mass killings is more people carrying guns, not fewer. “The fact that the college didn’t permit guards to carry guns, there was no one there to stop this man,” said Craig Schlesinger, pastor at the Garden Valley Church. In the wake of the shooting, a visibly angry Obama said that thoughts and prayers are no longer enough and that changes to the nation’s gun laws are needed. Some of the most poignant moments of Obama’s presidency have occurred in his role as consoler-in-chief. 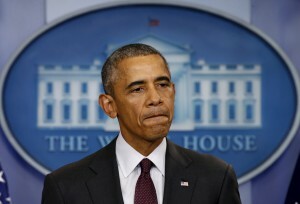 He led the grieving in Charleston, South Carolina, in singing “Amazing Grace.” He read the first names of the 20 elementary school students killed in Newtown, Connecticut, and asked how the nation can honestly say it’s doing enough to keep its children safe from harm.The shooting has sparked new talk about gun violence, though history suggests that prospects for enacting legislation are highly unlikely. This time, the White House says, the meeting is private. Obama was already scheduled to go to the West Coast trip when the shooting occurred, and the White House adjusted his schedule to include Roseburg. The shooting has sparked new talk about gun violence, though history suggests that prospects for enacting legislation are highly unlikely. Republican lawmakers are talking about the need to take up legislation designed to improve mental health care. Democrats are pitching the formation of a special committee to investigate gun violence, similar to what the GOP-led House established to investigate Planned Parenthood and the 2012 attacks in Benghazi, Libya, that killed four Americans. “No proposal is going to stop every shooting, but we can come up with solutions that stop some tragedies,” said Democratic Rep. Mike Thompson of California, the leader of the proposal for a special committee. Associated Press writers Jonathan J. Cooper and Gosia Wozniacka in Oregon contributed to this report.